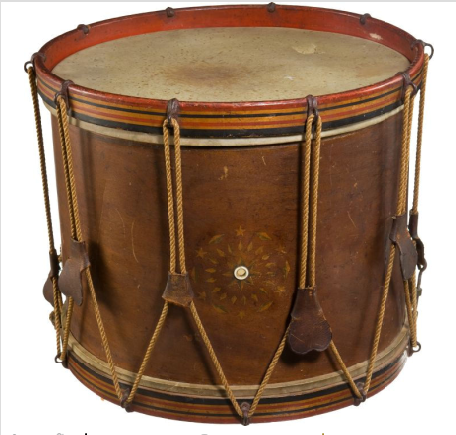 Historic 19th Century American Snare Drum. Very attractive drum in superb overall untouched condition, accompanied by a 4 7/8" X 6 3/4" period ink script note bearing the following information, headed "Green (Unable to decipher) Island / May 30, 1870, This drum was used by me (Wm Denice) in the first Memorial Day observation May 30th 1869, by order of J. A .Logan Commander G. A. R. I was Drummer boy in State of New York 1st Vol, in the Army of the Potomac '61 - '63. Wm Denice". The drum itself is of a form normally encountered C. 1865 1870. 17 1/2" diameter, 14 1/2" high. Overall wonderful untouched condition. The heavy hoops, which utilize iron hooks for the ropes to pass through, are decorated with alternating painted red and black stripes. The body of the drum actually appears to be of veneered mahogany, with a few hairlines in the veneering but no loss and very sound. The area around the ivory air hole is decorated with inlaid light colored wood stars, diamonds and leaves. Visible through the air hole is the following in period ink script, "Wm. S. Tompkins & Sons / Makers / Yonkers, N. Y. / Drums of all Sizes Made to Order / July 4th / 1865." Most unusual as an ink script 'lable' but absolutely authentic. Retains what appears to be the original rope including decorative woven section. Also retains all of the original leather tighteners, although three are missing the bottom portions. Both heads also appear to be original with a small hole, with no loss, in the top, and an old repaired crack in the bottom. Retains the original snares. The first Memorial Day was observed at Arlington National Cemetery by Logan's order in 1868, however beginning in 1869 the observance began to spread throughout the northern states. 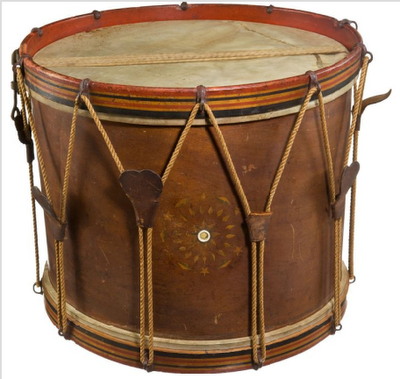 A great drum with a superb history. Estimate: $6,000 - $8,000. Civil War Infantry Snare Drum. 12 1/2" high, 15" diameter. Possibly slightly shortened during the period of use, as there are no interior reinforcing rims. Retains original heads including snares, top head break, with no loss, but shrunken. Light colored body, probably maple, with dark red hoops. The top hoop is missing a a 1/2" X 4" piece where one of the rope holes was drilled. The rope at that point is now held in place with a supplemental piece of wire attached to the adjacent ropes. The drum actually appears to have been struck, and continued in use after the 'field' repair. Body is decorated with narrow red and white vertical stripes flanking the air hole. The air hole is decorated with a red and white star with small brass tacks at each tip of the star. 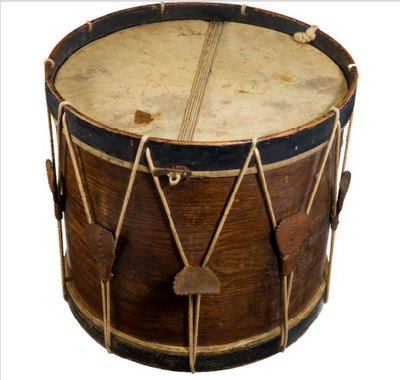 Drum is overall completely untouched and doubtless bears an interesting, but unknown, Civil War history. Estimate: $750 - $950. 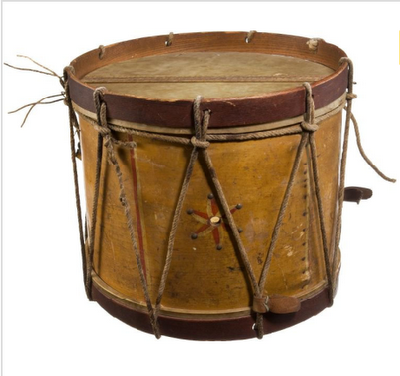 Very Nice Civil War Snare Drum With Interesting History 16 3/4" diameter, 15" high. Oak body with ivory air hole and nicely decorated with brass tacks. Black painted hoops. The drum is overall in excellent condition with nice untouched patina. Both heads are original and perfect. The ropes, while clearly quite old, are likely slightly later replacements, while the nicely decorated leather tighteners are period, all present, one torn, else all in excellent condition. 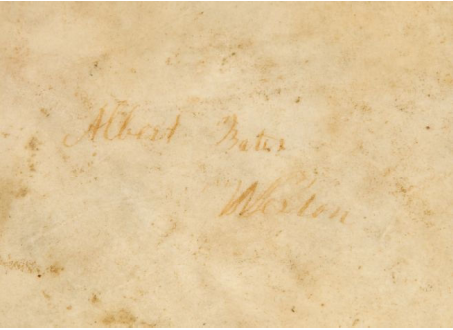 Written in brown ink at two places on the bottom head, which retains the original snares, is the name "Albert Bates" with one of the names accompanied by "Weston". There is also a name applied in ink with a very small stencil to the top head. There is no interior lable. 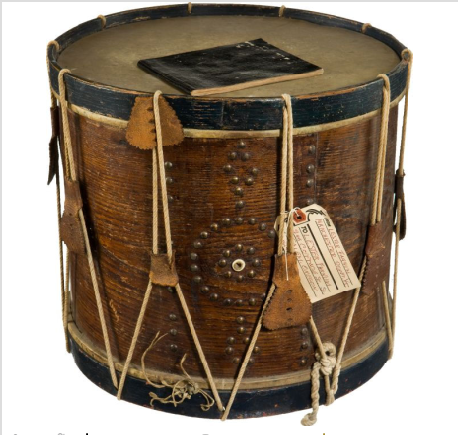 The drum is accompanied by a 5 3/8" X 6 5/8" heavy oil cloth covered music book with original orange paper lable on the inside cover, "Manufactured / By / E. Hopkins / 244 / River Street, Troy, N. Y." 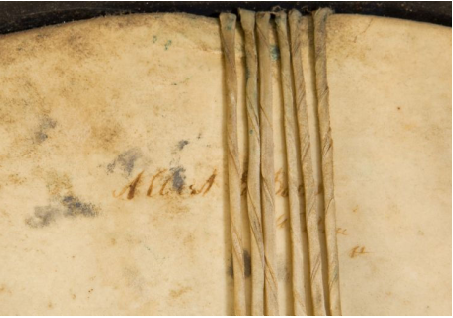 The book is printed with blank staffs which are then filled in with ink script drum beats to accompany identified pieces of music such as "Gen. Grant's Quick Step, Red, White and Blue, Funeral March" etc. An old shipping tag is also attached to the drum with "FROM Lester Farnum / Manchester Depot, Vt. TO Lester Farnum 245 Cottage St., So., Salem, Oregon." Very nice Civil War drum with a potentially very interesting history. Estimate: $1,600 - $1,800. Sold for $2,390.00 Nov. 12, 2011. 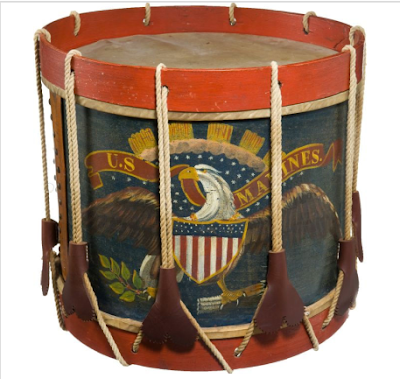 Exceptional Condition C.1859 Regulation US Marine Corps Eagle Drum. Certainly one of the finest specimens known of the handful of specimens extant. 14 1/2" diameter, 14" high. All paint correct and original and in superb condition. Retains what appear to be the original heads with just a couple of small holes at the edges. Ivory air hole, brass tack decoration, the body appears to be of maple. Original inner hoops, some pencil markings opposite the air hole, but no label. The ropes and tighteners are clearly an old restoration but extremely well done and detracts nothing. Generically probably the rarest of all US military regulation issue drums, this being a truly remarkable example. Estimate: $25,000 - $35,000. 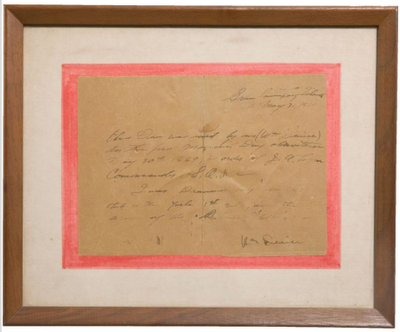 Source: Heritage Auctions, Lot 52096. 2-Ply Drum Shells -- When Did They Begin? I am an avid drummer and would like to settle a disagreement. 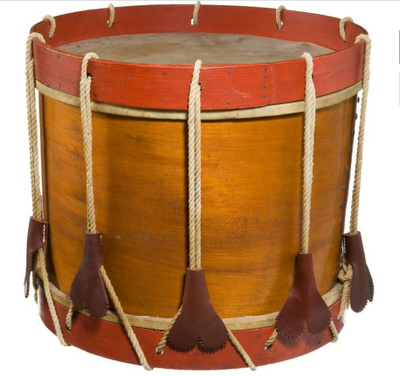 I think people were playing plywood-construction drums soon after the technology was developed in the 1850s, but some of my colleagues say Gretsch invented ply construction in the 1920s and before then, drums were solid shell or steambent. I have looked online but there really isn’t much discussion about this kind of thing. Can you please clarify? So, readers, any thoughts? Please email me at BlogMaster@FieldDrums.com. Hint: I have two drums by Wm. S. Tompkins (ca. 1860) and they are definitely 2-ply cross-grain laminate shells.